Since 2015 was a motorbike-intensive year the idea was born to combine the year’s seasons greetings with this dominating topic. This is how it has been done. I placed the bike on the walkway before our house (which is only for pedestrians and bicylces, so no cars interfered with the shoot, same road used in these shootings Link1 Link2 Link3). 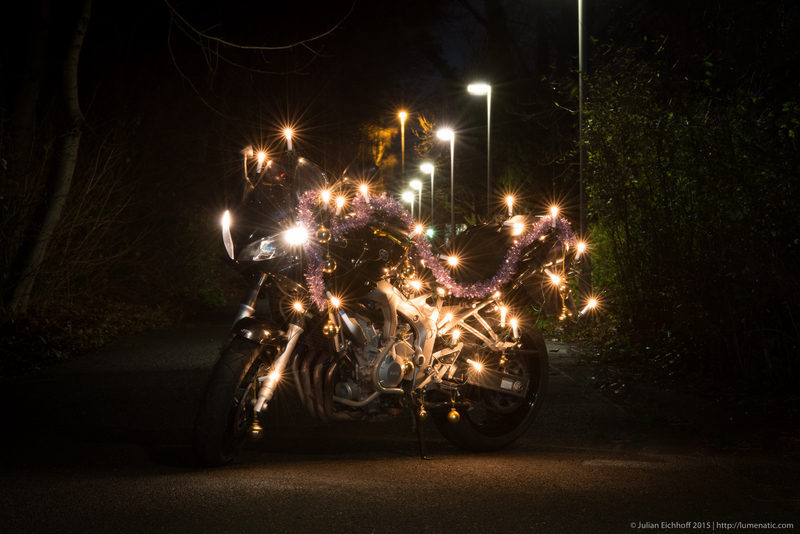 Then I started decorating the bike with electric christmas tree lights and ornaments. I clipped the electric candles everywhere I could: license plate, windshield, footrest, fender, everywhere. Then I hung the golden ornaments and placed the purple tinsel. 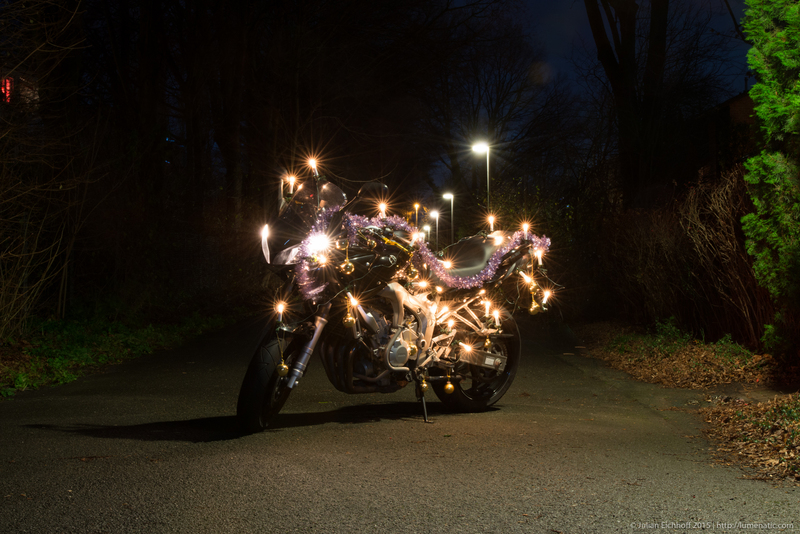 An extension cord brought power to the lighting and voilà – a kitschy motorbike. I used my Nikon D800 with the 80-200 lens and closed the aperture heavily. Most shots were made at f22 or f16/18. That produced a strong beam effect around the lightsources. Maybe I drove it a little too far and wider aperture would have worked, too. Well, you’re always smarter after a shoot. Setting up the shoot and shooting was quite funny. There were some pedestrians who completely ignored me and hastily walked past me. It had a little bit of a “let’s get away from that strange person quickly”… Some elderly women stopped and asked what I was doing. I told them it’s going to be a christmas card for motorcyclists and they happily strolled away. I especially liked the moment when one of our neighbours opened a window in the dark and took a picture of me and the illuminated bike. The neighbour wanted to be stealthy but forgot to turn off the flash of his compact camera. And so I was notified of his presence and waved at him in a jolly mood. The “Merry XMAS” was written with a small handheld LED torch. I set the exposure to 30s, triggered the camera and ran behind the bike, inscribing the letters into the air. I had to do nine takes before I was satisfied with the result. Post processing involved removing the power cord and some debris lying on the road. My favorite image from that series is the one with the lightpainted “Merry XMAS” since it required the most effort. My favorite motorcycle image is the one of the Suzuki GSX-R 750, since it came out exactly like I had it in mind for years. so I guess you must like riding motorcycle, right ? P.S: Why do I need to type again my name and email address when comment again? I already did that for the first time. This is a wordpress blog, correct. You can create one on your own on wordpress.com for free or host your own installation of WordPress on a dedicated server.